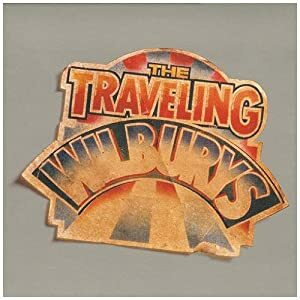 The Traveling Wilburys is such a preposterously huge idea that it would have to be real because no one would ever really imagine it. Think about it just for a second: a Beatle, Dylan, Orbison, and Petty? That's four guys in the Rock and Roll Hall of Fame for work they did on their own, and I've not yet mentioned the very talented Jeff Lynne. What's next? A band featuring Hendrix, Clapton, Peart, and McCartney? That quartet would never assemble, even if Hendrix weren't dead- although that certainly diminishes the plausibility of it all. Somehow, The Traveling Wilburys did and it is perhaps the greatest assemblage of talent and pedigree ever. Almost as impressive as the mere existence of a band like this is the way it handles the expectations game. Nothing can live up to the kind of hype that generates, yet somehow Traveling Wilburys did. If these guys tried to make a record worthy of this Holy Union, it would probably stink. Some supergroup records are vanity projects done in by their own weight. Some are undone by rampant democracy aimed at keeping egos from bruising. The Traveling Wilburys records, particularly the debut, overcome this by playing things down rather than trying to make the sum equal to the parts. These records are filled with simple pleasures and they are all the more enjoyable for it. It is one of the dumbest things ever that these two records would remain out of circulation for more than a decade. Someone should be fired immediately for allowing this to have happened. Fortunately, the wait is over and the records are back in stores in shiny, new packaging. It was a pointless wait, but the music was worth it. Some of Harrison's best work is on these Wilbury records. Jeff Lynne did some genius production. Dylan's participation revealed another side to the man, notably his sense of humor, but his best work resides elsewhere. Petty has perpetually been overshadowed despite his obvious excellence. It seems a bit more understandable in this crowd. Roy Orbison had been off the map for some time in terms of contemporary pop. The first Wilbury record (Orbison passed away soon after its completion) reintroduced that voice to a whole new generation. I don't know what I've enjoyed more: hearing some of these songs for the first time myself or watching TheWifeToWhomI'mMarried become something of a Wilburys fan. The two of us watched the video to "Handle With Care" at least three times Father's Day afternoon as we prepared to meet with family. Then, we listened to Vol. 1 in the car on the trip. It was fabulous. TWTWIM became a Tom Petty fan last summer, particularly when she heard "All The Wrong Reasons" (from Into the Great Wide Open) on the road to South Carolina. She's now developed a "healthy married person's crush" on George Harrison, mostly for "Handle With Care." How amazing is it that a woman who [inexplicably] doesn't like The Beatles now has a "healthy married person's crush" on one? How funny is it that she'd develop one on "The Quiet Beatle" and yet marry one of the web's great big mouths. She's also floored by the operatic power and beauty of Roy Orbison's voice. She's a funny one when it comes to music. She's a casual fan, not at all obsessed like I am. I'm constantly pushing bands at her, trying to get her to feel that same passion. It doesn't work. The more I push, the less likely she is to give any of it much mind. This past month, though, she became a bit more of a Stones fan and has come around on The Wilburys. The connection? I never even tried to get her to listen because I figured I'd be wasting my breath. The understated approach worked for the Wilburys, now it worked for me. The subversive possibilities are endless. Even if they're not, I now have one more album I can play in the car without getting TheLook and that is priceless.